For years, excess military equipment has trickled down to state and local agencies. For police departments nationwide, this influx doesn’t stop with armored vehicles, weapons of war, body armor, and camouflage fatigues. More obscure surveillance technologies, once exclusive to federal entities, are now operating freely in many cities. The most intrusive of these devices collect swaths of data–particularly from cell phones–unbeknownst to the target. These technologies, including cell site simulators (stingray), operate entirely outside the public sphere. Oftentimes, even courts aren’t sure if illegal surveillance technologies were used in an arrest. This extreme secrecy makes their use entirely unaccountable, and unchecked. No one knows who’s being targeted, when, or for what purpose. It’s an Orwellian state of affairs now provoking legislation be proposed to control rouge eye’s. 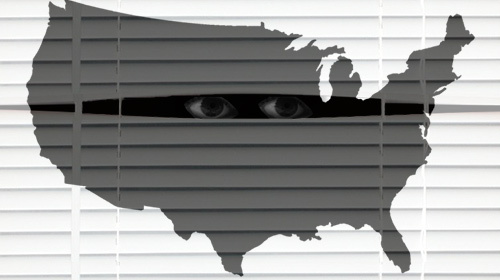 Pushes to rein in surveillance operations are currently blossoming in several states. In New York state, CityLimits.org reports, Council members Vanessa Gibson and Dan Garodnick are spreading the word of new bills across five boroughs. Their proposal, dubbed the Public Oversight of Surveillance Technology Act (POSTA), hopes to fully spotlight local surveillance operations. Specifically, the POSTA–if passed–would require police to notify the public upon purchasing surveillance technologies. That’s locally, which is a major step. New York is joining a momentum building across the country. No one from citizens, to lawyers, to judges and mayors appear fond of unchecked surveillance. “Big brother”, however, does not assume the same guise everywhere you go. On the state level, officials are attempting to crackdown on warrantless police surveillance. According to CityLimits.org, state level initiatives currently take the form of two bills bouncing about government halls. These focus on ensuring police first obtain a warrant to target specific devices, or phones. Such admirable ambitions, unfortunately, are complicated by the sheer variety of tech available to police. Cell site simulators, or Stingray–for example–trick your phone into communicating with it by mimicking cell towers. The dummy tower then collects data including GPS, and other sensitive real-time information. Other departments instead go tower dumping, which involves obtaining massive amounts of data from countless devices, then narrowing down the search. How one formalizes a warrant for a specific device when officers perform tower dumps, for example, is unclear. Even Stingray, many experts warn, may collect data other than the target’s. Some cities utilize facial and/or license plate recognition technologies, or similar devices. With each passing year, surveillance and intelligence gathering tools become more nuanced. Departments also have access to drones, and other devices they rarely publicly acknowledge. Regulating these technologies, and the operations they’re drafted for, presents daunting legislative challenges. Transparency is further restricted by the very nature of police surveillance operations. For one, not every officer in a given department is necessarily aware that operations are occurring. In New York, for example, only 1,400 NYPD officers of a 36,000 strong force are involved in surveillance- intel op’s. Of those, not all are involved in the same op’s, or using the same tech. These endeavors are tightly compartmentalized, and departments often treat surveillance devices as deniable assets. Another challenge is determining whether a given department has outsourced some of it’s capabilities. During the Standing Rock standoff, it was discovered by The Intercept that Morton County’s surveillance against protesters was handled by a contractor. Tiger Swan–the company in question–shares ties to the defunct mercenary contractor Blackwater, and other private military forces. The contractor’s full operations, however, and how those were conducted largely remain unclear. Similarly, after DAPL, large scale police surveillance operations elsewhere may, or may not, be outsourced. If that’s the case, then how effective could a legislative perspective even be? Nevertheless, open pushes to both acknowledge and regulate surveillance technologies is refreshing to some. Too often it seems, even talk of police surveillance tech is shunned into the corner and labeled “conspiracy”. It’s difficult to find such comments either productive, or accurate. Bringing police surveillance issues to the forefront may prove to be a catalyst for other movements to come.